The Bead Society of Great Britain have been selling the roller balls from Mum deodorant along with patterns and books to raise money for their bursary fund. Having bought the previous Bead Society books and made many ornaments for family and friends, I wanted to design and make my own for Christmas 2005. I played around with many different ideas before settling on this one and realised that, because of the design, the bead sizes needed to be accurate, so worked it in delica beads. 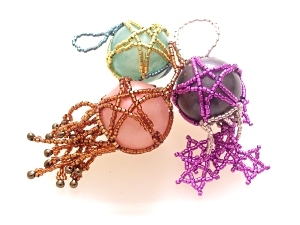 The ornament uses netting to form the star motifs, which are joined to each other as you bead. You can then add as much or as little fringing as you'd like.